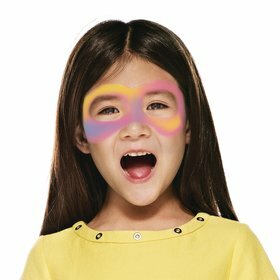 With a sponge, use pink paint and draw two semi circles around the eyes. One semi circle should be below the left eye and above the eyebrow on the other side. Don't forget to cover part of the nose. Once this has dried, with another sponge and yellow paint to draw a semi circle around the top left eyebrow. You can use the yellow paint and cover a small part of the bottom right eye. Finally with another sponge, use blue paint to cover a small shape at the top of the left cheek and to the right of the top of the nose. With a thin brush, use black paint to draw a line on the forehead following the shape of the eyebrows. Add three small teardrop shapes on each side of the middle of the forehead above the line. You can even draw some swirls from the middle of the nose to the cheeks. Add two small teardrops at the corners of each eye. 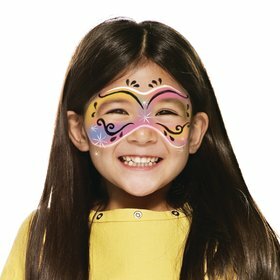 With a thin brush, use white paint to draw a line in between the teardrop shapes and the black line on the forehead. 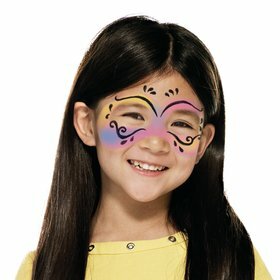 Draw a white line over the cheeks and nose below your black swirls. You can then add small stars on the tops of both cheeks and on the nose.